Organic cape gooseberries (or physalis) grown on our French farm. These bright orange berries hold great promise, wrapped in their natural paper casing. But they don’t just look festive. They have a sweet-sour punch that’s a lovely palate cleanser or after dinner treat. They’re especially good served alongside chocolate cake, crumbles and puddings to counterbalance the richness. Open the husk slightly before serving to show the berry peeking out for attractive effect. Remove husks before eating. 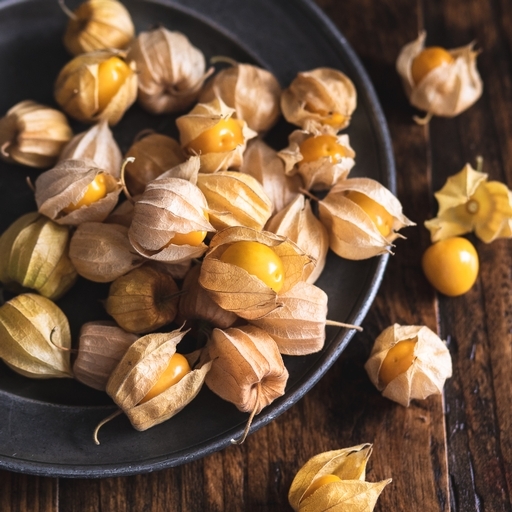 Grown on our farm in France, and related to the tomatillo, cape gooseberries are in season in autumn.